After finding out Emperor Dark was a no-show for villainy, I was in a rush to find someone to replace him in the tournament coming up. I couldn't pit him against anyone, all he'd do is talk to him opponent or ignore him. I happened upon Ring Raiders, a five-episode story featuring time-traveling pilots. It's a surprisingly good show, and probably the first cartoon I've ever seen that even mentions the Vietnam War. The Ring Commanders are a group of exceptional pilots plucked from different eras(usually before they're about to die). They're given fantastic planes, all based on real-life military jets, and special rings, which grant them powers when the pilot says, "The command is in my hand!" They're pitted against the Skull Squadron, led by Scorch, who plans to take over the world with his time-traveling powers. Both teams are housed in flying headquarters and have fleets of generic planes with equally nameless pilots with the Ring Commanders each leading a wing. Since the series didn't last that long, we didn't get a chance to find out much about Scorch. There's a few flashbacks through the series, one telling the story about how Scorch turned against the leader of the Ring Raiders, Victor Vector, crashed into a mountain and burned half his body before being kicked out of their flying academy. The second was about his rise to power - his scientists blasted him with a special ray that made him bigger, stronger, and almost invulnerable to damage. Too bad the show never give us a real example of those powers, since we either see him sitting in his cockpit or a command chair in his base. Speaking of the flashbacks, the five episodes do a great job of showing us how each of the Ring Commanders were recruited. Most of them got their own episode consisting of a lot of backstory. I can only assume those that weren't featured would have gotten their own episodes if the show were allowed to continue. I'm not exactly sure why the show didn't continue on - time travel and fighter jets sounds like a good combination to me. Come on, dinosaurs even! The only real problem I have with the show is the rings themselves, granting the pilots upgrades to their plane, improved radar capabilities, healing, powering the headquarters after a lightning strike. They can do practically everything and when time travel sounds more reasonable than the ring powers, that's a problem. Coolness - 6. 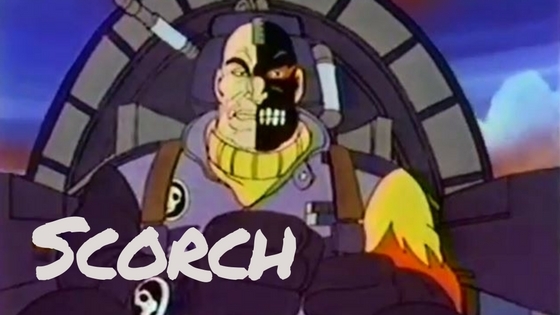 Scorch is a pretty cool looking guy; he's got a skull face mask covering half his face, there's a flame motif on most of his clothes, and he's a big dude. His voice is provided by Rodger Bumpass, whose 80s roles also included Louis Tully in Real Ghostbusters and hero Mark Fury in Robo Force. Rodger gave him a great voice very reminiscent of David Kaye's Megatron in Beast Wars. I only wish we got a chance to see what his powers were besides breaking the restraints on the lab equipment that gave them to him. Scorch flies Scorch's Torch, a modified Saab Viggen outfitted with all sorts of incendiary weapons. Effectiveness - 3. Unfortunately, Scorch doesn't get a lot of opportunities to show off his tactical acumen. Most of his plans start off pretty good, and he's a pretty smart bad guy. He talks about "In combat, firepower is only half the battle; brilliant strategy wins the war," but then at the end of the episode gets in a shouting match about who came up with the idea that just failed. I only wonder if his schemes would have gotten dumber as the show went on like so many other villains suffered from.